Based on the mangaof the same name. 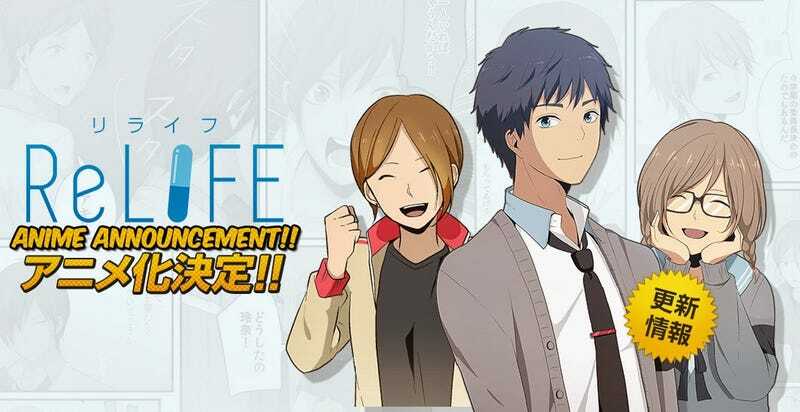 TMS Entertainment has revealed that the Manga ReLIFE will have an Anime adaptation of this manga. The manga’s story revolves around Arata Kaizaki, an unemployed, single 27-year-old who has just been cut off from his parents’ financial support. Unable to find a job due to his leaving his previous employer within three months, he is stuck. One night after drinking with a high school friend, Arata meets Ryō Yoake, a man who offers Arata pills to turn him back into a 17-year old so he can redo his life. After agreeing to the experiment, Arata joins a high school class, and meets Chizuru Hishiro, a socially awkward silent beauty who yearns to have friends. Through connecting with her and other classmates, Arata must find what he lacks to live a happy life in the real world within a one-year time limit.